All birds need toys, not only to alleviate boredom, but to provide a valuable chewing exercise. Because the safety of your birds is so important to us, we at Animal Environments use no chains or dangerous clip-type devices. Our safe quick-link fasteners attach easily to our cages' built-in toy rings. As an added bonus, all our toy parts are completely replaceable, ensuring long life. 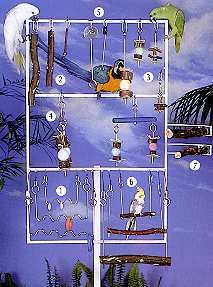 5 - FOOD KABOB - A handy way to hang your bird's favorite fruits and veggies. 6 - MANZANITA SWING - Provides varying thicknesses for healthy feet. 7 - EASY MOUNT PERCH - Available in two sizes. Beautiful manzanita or eucalyptus perch that mounts with the twist of the thumb. Attaches to any side of the enclosure. Luxury Bath - Built to last a lifetime, the Luxury Bath features stainless steel construction and dual manzanita perches. Provides hours of enjoyment while keeping feathers healthy and attractive. Germicide - A necessity for maintaining a healthy environment. "Wavicide-06" is a hard surface disinfectant spray. Kills bacteria and germs in the cage. Pleasant lemon scent. Will not harm paint surface. 2 year shelf life. Constructed of cold rolled steel, and available in white, gray and almond. 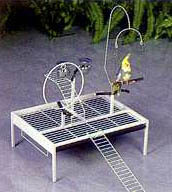 Provides hours of climbing enjoyment for your bird and can be placed anywhere within the cage. Here is the answer to all of your storage needs for the Acacia cage. Designed to fit securely against the pedestal stand, the shelf can accommodate food, accessories, toys and more. Featuring quality steel construction, the shelf is available in any color to match your cage. It requires to hardware and attaches in seconds. This versatile option is designed to sit directly on top of the cage without hardware, or can be used independently, anywhere. Sized for mobility and easy storage, the Playpen includes ladder, 2 toy holders, 3 manzanita perches and 2 exclusive canopy feeders designed to keep food and water free of droppings. (Shown here with optional swing hanger and toy ring.) Components are interchangeable. Elevated grate and removable plastic tray ensure the health and safety of your bird.